A prime 2.96ha waterfront development site in the heart of Townsville’s Breakwater Marina is on the market. A prime 2.96ha waterfront development site in the heart of Townsville’s Breakwater Marina and near the Townsville Entertainment and Convention Centre has been placed on the market. The landmark Saltwater site, located at 48 Sir Leslie Thiess Drive, is immediately adjacent to The Ville Resort-Casino (formerly known as Jupiters) and is expected to generate interest from both Australian and Asian investors, who have shown keen interest in the region. The property is part of the once extensive portfolio amassed by former Gold Coast developers Resort Corp, which collapsed in 2009 and took with it an estimated $1 billion worth of planned residential and tourism developments in Queensland’s north. Projects that were scrapped included Resort Corp’s planned $500 million Saltwater residential and retail precinct. Stage one of Saltwater was to include 100 boutique resort-style apartments and 73 northeast-facing waterfront apartments. Ferrier Hodgson, as appointed receivers and managers of Resort Corp, has engaged Peter Wheeler and Darrell Irwin from Colliers International to market the property for sale via an international offers to purchase campaign closing on October 6. The Ville Resort-Casino is undergoing an extensive $35 million redevelopment. The Holiday Inn, which is popularly known as the Sugar Shaker, was bought by Singapore’s Grand Hotels International group for about $15 million in July. It is one of a string of recent deals that show that Townsville’s property market is widely considered good value by investors, with encouraging prospects for growth from the pending development of a new Townsville stadium and deals such as Australia’s defence and trade agreement with Singapore. For example, the Brisbane-based Mahil Group also purchased the Central Hotel, located in Palmer St, Townsville, for $9.5 million in August. 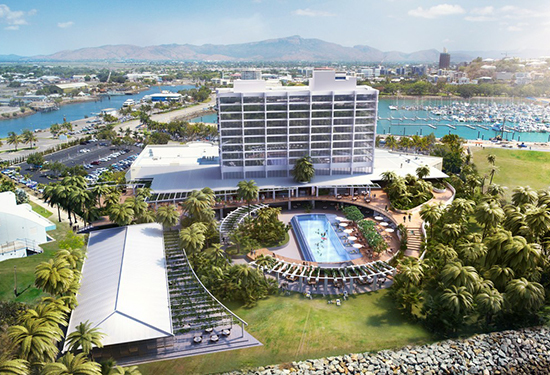 The Ville Resort-Casino is also undergoing an extensive $35 million redevelopment, including refurbishment of rooms and the construction of a resort-style pool with infinity edge and swim-up bar, amongst other plans. The Saltwater site is comprised of five community title lots, totalling about 29,638sqm of land area with about 440m of water frontage. The site has a preliminary approval for a mixed residential development and a development approval for 49 apartment units and 94 holiday units on Lot 3. The preliminary approval allows for up to an estimated 61,000sqm of gross floor area across the site. Colliers says as the site is located within the greater Townsville CBD, it may qualify for development savings as a part of the Townsville Council’s CBD Development incentive program.